How motion capture and real life materials added realism to the latest movie. The latest Spider-Man movie, Homecoming, places more of an emphasis on storytelling and character than on over-the-top CG sensationalism. Achieving an air of realism while telling the story of a web-slinging superhero was no easy feat, though. Extensive motion capture was conducted to understand the movement and behaviour of Tom Holland, and a character rig allowed for the muscles and breathing to be controlled. "Dialogue lines were extracted and fed into Maya to drive the jaw so we could get as much expression through that mask as possible," says Matt Dessero, VFX supervisor at Method Studios. It was also important to differentiate this Spider-Man from that of previous movies. "One thing unique for this Spider-Man was the directive from our director Jon Watts that he didn't want to see him in any hero traditional poses," reveals Matt. "This is a young Spider-Man, who hasn't become one with his powers yet." A weapons deal on the Staten Island Ferry that goes horribly wrong serves as a pivotal moment that results in Spider-Man losing his high-tech suit and having to redeem himself in the eyes of his mentor Tony Stark. 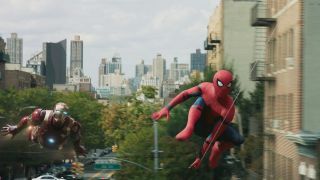 Digital Domain VFX Supervisor Lou Pecora and his team put together the nine-minute-long action sequence featuring the wall crawler trying to pull the split vessel back together with his webbing. Once more, motion capture was integral to capturing Spider-Man's emotions. "We motion captured Tom Holland pulling on ropes, as well as his facial expressions," says Lou. "You can tell even underneath the mask when his mouth is open or his eyes are getting big. There's a cool effect that they did with the suit where the eyes worked like the thin metal blades of a camera aperture that slide up together to open and close, which gave it a real world mechanical feeling." Getting Spider-Man's signature webbing right posed another challenge, and various materials were examined in the search for the right material. "We looked at nylon and spider webs but decided upon polar bear fur, which consists of a bunch of transparent microtubes," says Lou. "The tubular quality allowed us to refract light through them in a more interesting way." This article originally appeared in 3D World issue 224; buy it here!